Meet Matt Bischoff, who will be competing for Beard Team USA in the freestyle full beard category at the World Beard and Moustache Championships in Brighton, England, on September 1. 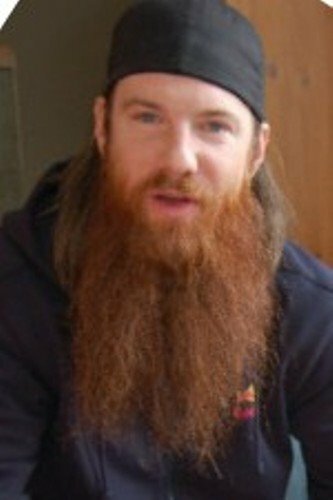 Matt's long, red beard is permanent -- much like a tattoo. Now meet Hans Langseth from Norway. According to Guiness, the late Hans sported the world's longest beard. In fact, Longseth's beard is or was on display at the Smithsonian, the same as the Hope Diamond and the Spirit of St. Louis. Someday Matt hopes his beard will be as long as Hans's was. 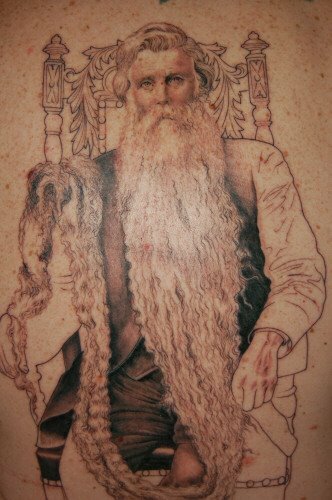 Not only is Matt's beard here to stay, so is the tattoo of Hans Langseth on Matt's back. Also like Matt's beard, the tattoo is still a work in progress. 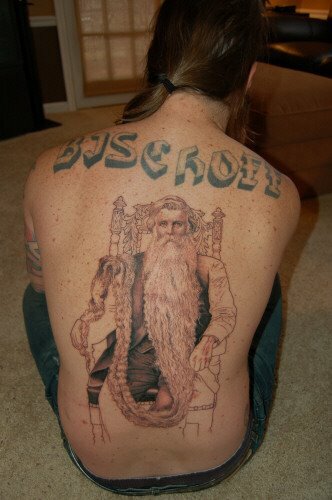 In the case of the tattoo, the artist is Chris Garver. Matt, his beard, and his tattoo will be featured on an upcoming episode of Miami Ink on cable TV (TLC). Stay tuned. I saw the episode of Miami Ink last night , Great tat , wish I knew were he got the pic of Hans would love to have a copy to frame! wow, I got an email from a friend telling me about this and I was in disbelief, because I am the Great Great Granddaughter of Hans. Just to let you know he was from Norway but spent most of his life on a farm in rural west-central North Dakota. I am looking forward to watching the re-run of the show! Matt - Good luck in September!!! I saw the episode of Miami Ink and loved your enthusiasm! You're love of Han's and all things "beardly" was inspiring! Hi Matt, I saw the Miami Ink show and could not believe it. I am also a great, great, great grandaughter of Hans Langseth. My Dad has a gold piece that Hans won in a contest for having the longest beard. We also have several pictures of Hans and his beard. It is sort of cool that someone has recognized Hans and his beard. Good luck at the competition. Just thought I would join the list of Hans' great-great grandchildren who are supporting your quest. You know it was actually his underbeard, the part that grew from his upper neck and not just his face, that was so long. When he died it was a full foot longer that his 17 1/2 foot record. Good luck and thanks for bringing Grandpa Hans into the spotlight. This is my great-great grandpa as well. I feel like this is a family reunion too! Good luck Matt! Just wanted to join the family in supporting you, Matt. I am also a great- great- granddaughter. I am Jay's and Tracy's cousin Alicia. We all have that picture, I even have copies for all 4 of my children. I to would like to keep our little claim to fame, but the best of luck to you. I am the great granddaughter of Hans. I have two pictures of Hans in my family room. My dad knew him well but shaved every day.I love to tell the story to new people I meet but only after I know them long enough so they don't think I am wierd. I also saw this episode on Miami ink, however when I was watching it, i thought wow that is cool because Hans Langseth is my great-uncle. Hans is also my great grandfather. The Langseth family is bigger than people think. I am not related to Hans in any way. Although I wish I was. I'm an 18 year old beard grower who just has to tip his hat to Hans Langseth. He's pretty much my hero. I'm also related to Hans (he's my5x great uncle), but could never come close to growing my beard that long. Dig the tatt. Saw the rerun of Miami Ink and had to look into this Hans Langseth thing. That's one heck of a beard. ND winters are cold, I could use 18ft of insulation myself. I also went to NDSU with a Langseth gal, cute girl, no beard though! Props to your beard and your tatt Matt! Now that's dedication! My great, great grandfather would be proud of you. We have a new web site honoring him. It's www.hanslangseth.com.